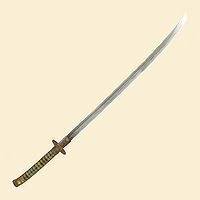 Weapons in Oblivion fall into three classes, organized around the three weapon skills: Blade, Blunt, and Marksmanship. 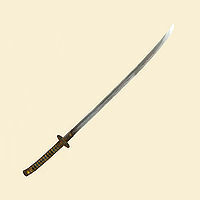 Blade and blunt weapons come in both one-handed and two-handed varieties, whereas marksmanship (bows) can only be used with both hands. 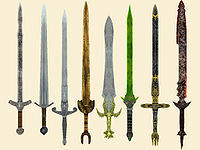 Oblivion-Weapons: Category listing of all the weapons available in the game. Search Box: Type the name of the weapon into the search box on the left and click the search icon to find the weapon. The Skill in this calculation is modified first by the player's Luck. As usual, the Strength and ModifiedSkill values are constrained between 0 and 100. When calculating damage done by bows, you must change the Strength attribute to Agility. The maximum damage that can be done with a weapon (i.e., for Strength=100, Skill=100, and 125% weapon health) is actually almost 20% higher than BaseWeaponDamage; therefore the Damage values quoted in all of the following tables are not equivalent to the maximum damage possible with that weapon. WeaponHealth degrades by (0.06 * BaseWeaponDamage) with each weapon strike. For example, a Daedric Longsword with base damage of 24 will lose (0.06 * 24) = 1.44 points per strike. 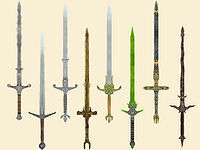 Some creatures (for example, ethereal undead) are immune to damage from normal weapons; these creatures will still be damaged by silver and daedric weapons, and any other weapons highlighted in the following tables. Most items are spawned from lists based on the player's level. The following table describes the minimum level at which a weapon type begins to show up in randomly generated loot; lower level weapons will also randomly appear. Enchanted versions of weapons will begin to appear two levels later; see Generic Magic Weapons for details. See Leveled Lists for details on how these lists are used to determine the probabilities of individual items appearing. 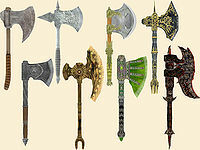 Note that non-random items also exist, and include steel and silver weapons that are available even to a level 1 character. This table applies to the vast majority of the randomly generated weapons you will encounter; weapons on NPCs and creatures are based upon the loot column. 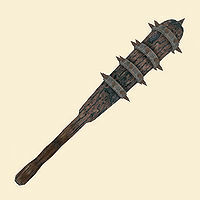 There are very few places where randomly generated weapons will appear at lower levels than listed in the table. †Steel weapons will be found at level 1 on skeletons. 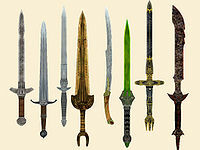 ††Fine Iron and Fine Steel weapons never appear in random loot; glass, ebony, and daedric quality weapons are never available from vendors before plug-ins. 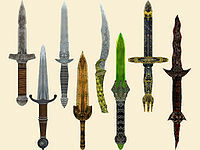 Although Fine Iron and Fine Steel quality weapons will not be found as random loot, they will frequently be found on NPCs whose inventories are not randomly generated (in particular, guards). These weapons ignore Resist Normal Weapons effects. †The second type is only found during the Tutorial. Two can be found on the dead skeleton. 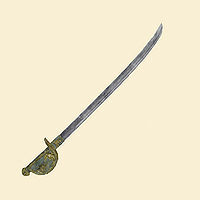 †Sharpened Cutlass is renamed to Fine Steel Cutlass by the Thieves Den official plug-in. 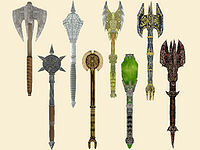 †The speed and reach of all Elven War Axes (both unenchanted and enchanted varieties) are different from those for all other War Axes. 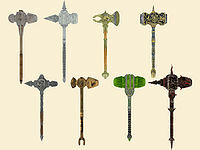 ††If you have installed a certain version of the Unearthing Mehrunes Razor official plug-in, there is a bug that affects all standard Daedric War Axes: the base damage is reduced to 8 (not 22) and the axes will crumble to dust when you pick them up off the ground. †This type of club is only found during the Tutorial. One is carried by the dead Goblin Shaman and two others can be found in the crate and the barrel in the same room. 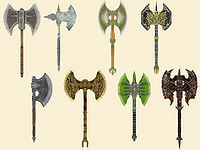 †Fine Steel Battle Axes only appear for sale from certain merchants (mostly smiths), or may spawn in specific cupboards containing weapons. †This type of bow is only found during the Tutorial. One is found next to the dead skeleton and another is carried by a Goblin. ††Black Bows are only available from Black Bow Bandits. 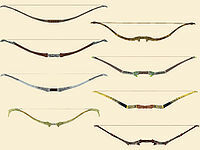 Despite the name, Black Bows are identical in appearance to Steel Bows. 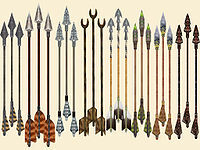 †These Quiver icons are not actually seen in game, but can be found in the game files. This page was last modified on 21 May 2018, at 18:05.